February this year USGS has sent another satellite up into orbit to continue observing the earth. 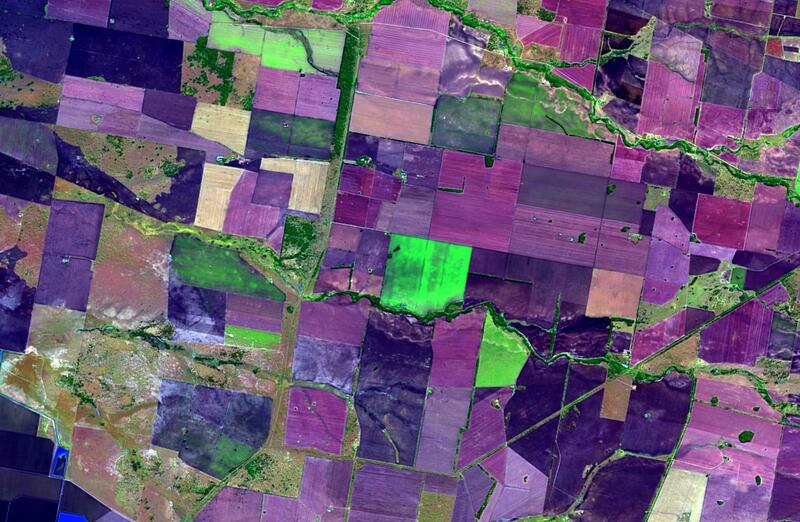 This satellite, named Landsat 8, provides the same spatial resolution in all bands as Landsat 7. That is one pixel equals 15m pan-chromatic and 30m for all other bands (excluding thermal). In addition, it has a couple extra bands for water, cloud and surface temperature (this link explains the other similarities and differences in more detail). Here is a sample that I have pan-sharpened using the open source Orfeo Toolbox. Bands displayed are 6, 5 & 2, which is comparable to 5, 4 & 1 in Landsat 5 & 7. This image was capture 27th of May 2013. Most of the bright green paddocks are canola and you can see some of the earlier cereals coming through. More info: As suggested in comments, Spectral Transformer for Landsat-8 imagery by GeoSage is another free option for pan-sharpening Landsat 8 imagery. I have tried it and it works well if you don’t mind following some simple command line instructions. Check it out at this link. Even more info: To get an idea of the best Landsat 8 band combinations and comparison with Landsat 7 bands check out this blog article from ESRI. What Google is doing with the earth’s satellite imagery is really quite amazing. Check out Google’s Earth Engine. On the landing page you get some great videos. I recommend Amazon Deforestation: Timelapse and Drying of the Aral Seas: Timelapse. Once you have had enough of these visit their data catalog where you can load any of the common earth observing satellites into a Google Workspace which is the Google Map environment with additional features allowing you to display the satellite images. Google say they have developed their Earth Engine mainly for monitoring deforestation which is valuable but there are several ways this technology is useful in agriculture. For example load the MODIS Daily EVI into the Workspace. Once in the workspace go to a farming area you know well and you can monitor how much (healthy) crop is established. Although MODIS imagery is free to download, Google take out all the processing time and make it easy to keep an eye on the district. MODIS EVI captured on 2012-12-05. 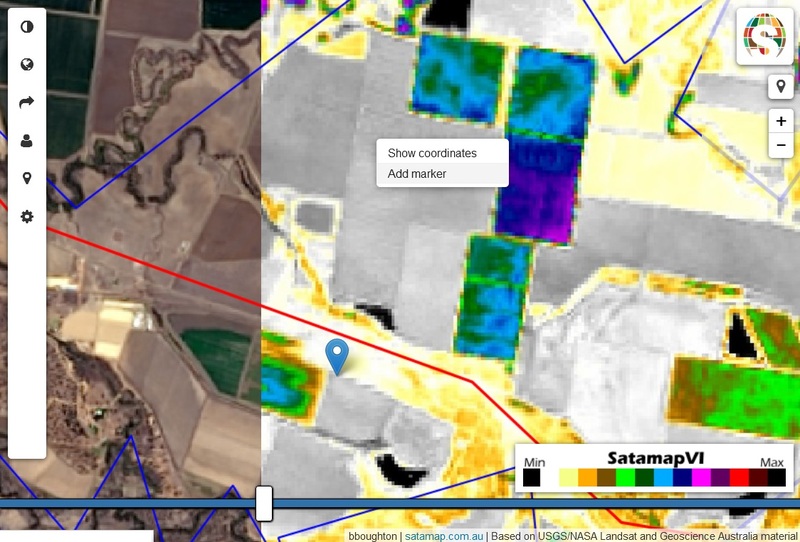 Showing area north of Moree NSW Australia. Google Earth Engine used to display image. If you were wondering where the agmapsonline homepage image comes from – this is it. A Landsat5 image captured on 23-03-2010. 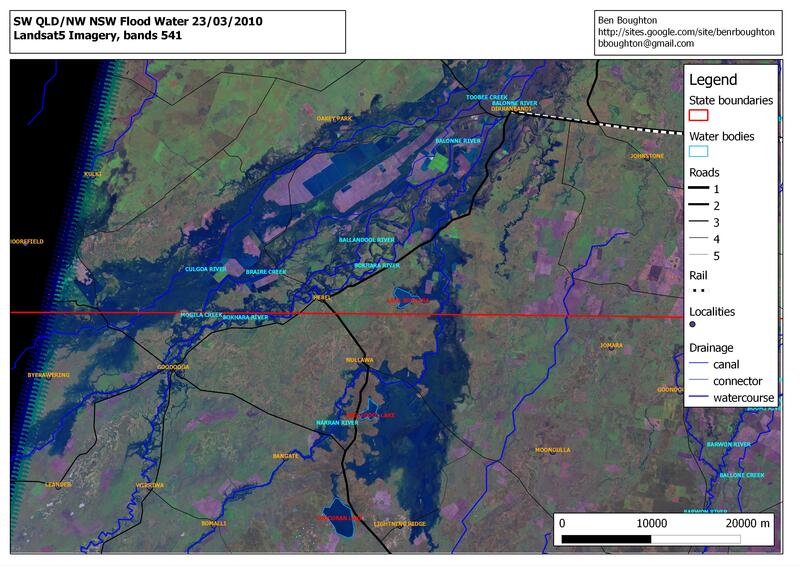 We have had two floods that have exceeded this flood level since. Notice that the cotton paddocks remain completely protected. In fact you will find many cotton farmers still irrigating during large flood events. Other areas where the water spreads out is useful for filling moisture profiles and dropping valuable nutrients. This is not a ‘true colour’ image. Of the three layered bands used to create the image I have only used one colour band and that is blue. The other bands used to produce the image are near infrared (NIR) and short wave infrared (SWIR). The SWIR, NIR and Blue bands are applied to the red and green and blue scales respectively to produce the image that you see. This combination shows up healthy vegetation as bright green and water as blue (even though inland water is generally brown). Learn more about this here. Click on image to view it full size.